Delta's Charlotte has the opportunity to shake up the city's Southern cuisine, a.k.a. soul food, market. The owners held a media day and ribbon cutting ceremony on Friday, which I had the pleasure to attend. Over the past year, you might have seen the renovation signage on the windows of the building that last housed GW Fins, and now that space is the new home to the second location of Delta's restaurant--the original is in New Brunswick, N.J.
Delta's makes its presence known in the 525 N. Tryon Building. Photo by Jon Strayhorn. This by no means is intended to be a review of Delta's. I believe you can't thoroughly do that until a restaurant has been up and running for at least a month or two. So this is more so my first impression, which is a favorable one, thanks largely to the meal I ate there. Because that's what it's really about--the food. 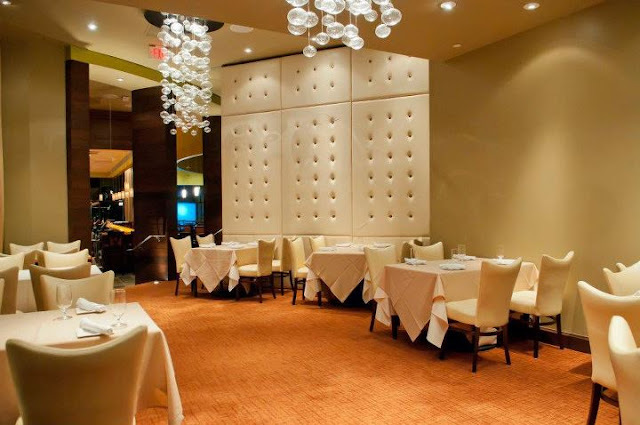 The restaurant is one of the largest in Uptown at 9,000 square feet, and the decor is filled with rich woods and leathers, beautiful artwork and colors, and soft lighting. 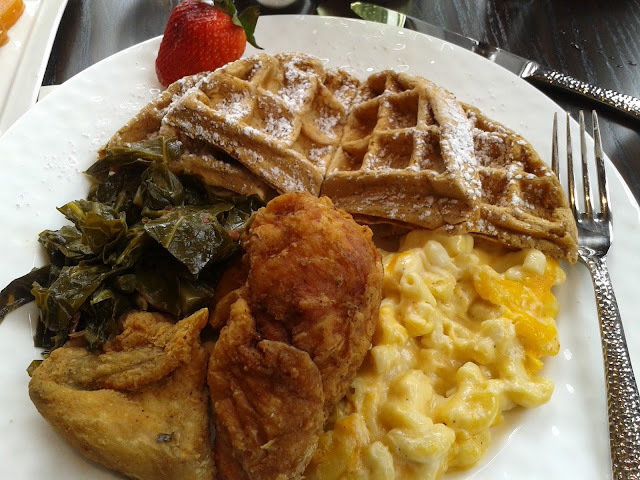 It, in my opinion, is Charlotte's first upscale soul food restaurant. Inside one of Delta's large dining rooms. Photo by Jon Strayhorn. But again, it's about the food. Several restaurants have opened in Charlotte over the past couple of years, signaling that the dining market is bouncing back after the recession. Each one, it seems, outdoes the previous one when it comes to decor and ambiance, but they don't always hit the mark with the food. Delta's seems to. The fried chicken and sweet potato waffle, with collard greens, baked macaroni and cheese, and candied yams was one of the most delicious meals I've had in a long time. I, literally, was thinking about it later that night, and I don't typically crave food like that. Phone pic of the meal I had; so much food the yams didn't make it into the shot. 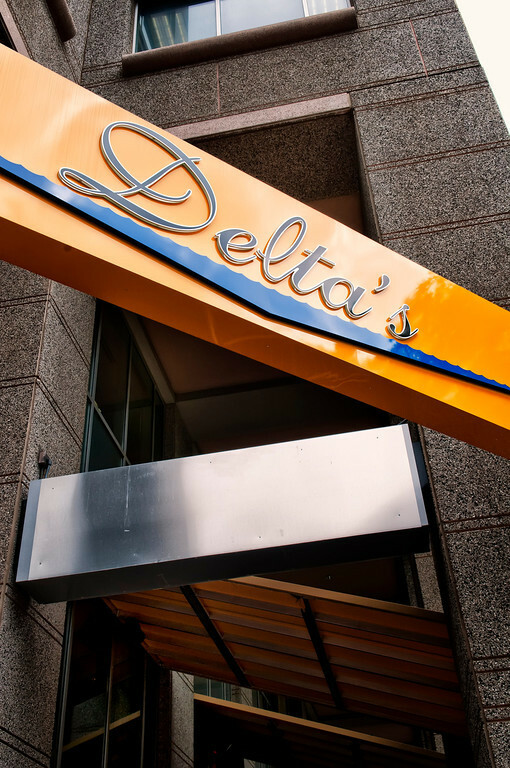 You can experience it for yourself when Delta's Charlotte opens its doors this Thursday, April 26, at 525 N. Tryon St. (www.deltasrestaurant.com, facebook.com/deltascharlotte, 704-612-2633). The planned hours are Tuesday and Wednesday, 5 p.m.-12 a.m.; Thursday to Saturday, 5 p.m.-2 a.m.; and Sunday, 1-8 p.m. It will feature happy hour, dinner, live jazz and R&B, and Sunday brunch. The owners, who've operated the first Delta's location in New Jersey since 1999, have made Charlotte the first market for their planned expansion. The restaurant's tagline is "Celebrating the Spirit of the South," and now it's doing that in the South. The Queen City has had the appeal of expansion as of late. American Roadside did the same thing when it opened in Uptown last fall, making Charlotte the first market it expanded to after having one location in Smithtown, New York for several years. Thanks for the review...I'm going to check it out with a group of my friends for a bday dinner. Had and opportunity to visit Deltas for the first time and was greeted with a WOW factor. The ambiance of the restaurant was first class and the food delicious.